The New York Times reported last month that the “extraordinary Mexican migration” of the past three decades that brought millions of people to America “has sputtered to a trickle.” Net unauthorized migration from Mexico—the combined number of undocumented immigrants entering and leaving the country—has been reduced to nil. But the fact that the great migration slowed is not in and of itself major news. 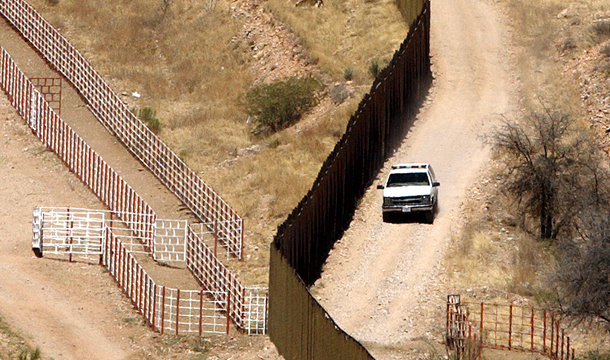 Scholars point out that the Great Recession and enhanced border security severely cut down on the number of Mexican immigrants seeking to enter the United States. When this decline in attempted entries is coupled with historically high rates of apprehensions at the border, we are left with a dramatic decline in undocumented immigration. But what will happen to migration flows once the recession ends and the American economy revs up again? To answer this question, we must understand a lesser-known story: how much Mexico itself has changed over the last few decades and what these changes will mean for the future. A combination of an aging population and economic growth means there will be fewer Mexicans in a position to migrate to the United States and more job opportunities within Mexico itself. Even though out-of-touch nativists continue to shout inflamed rhetoric warning of the threat of millions of Mexicans waiting to cross the border to lay waste to the American Dream, the reality is that the supply of people looking to leave Mexico is not limitless. 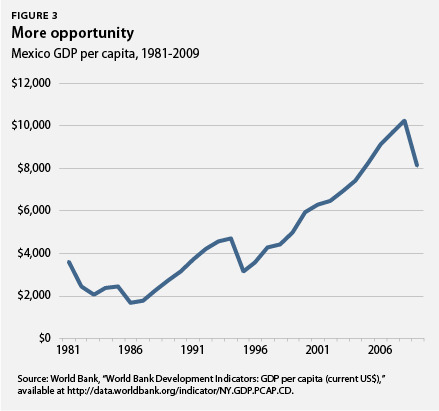 All evidence suggests that Mexico’s demographic and economic shifts will only increase in the future, further decreasing the pressures to emigrate. These shifts in Mexico will deeply affect the shape of immigration in the United States. Mexican immigrants comprise close to 60 percent of undocumented immigrants (6.5 million out of 11.2 million) and 30 percent of all immigrants (11.5 million out of 38.5 million). Here we take a closer look at the changes within Mexico and offer recommendations for adjusting to a future with far fewer Mexican immigrants seeking to enter the country. 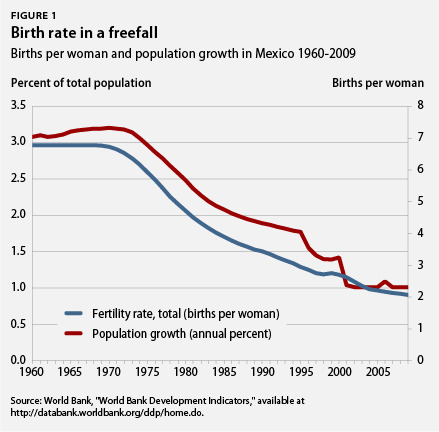 Mexico’s median age tells a similar tale. 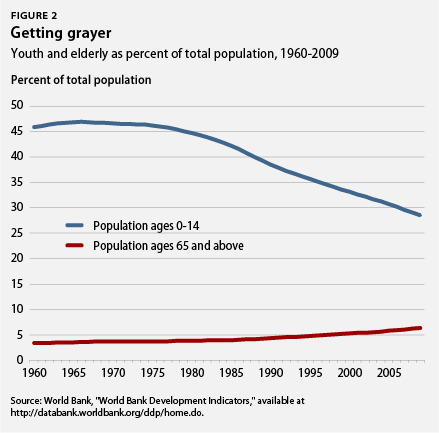 In the 1960s it was only 18 years of age but by 2010 it had risen to 26, suggesting an aging population. What these shifts tell us is that soon there will be far fewer people seeking to enter the labor force in Mexico and far more people leaving it. An important factor in pushing young Mexicans to leave their home country is quickly evaporating with fewer people competing for jobs. Likewise, the percentage of the population living in poverty—based on the cost to feed themselves and their families—has fallen significantly since the middle of the decade, from roughly 40 percent between 2002 and 2007 to less than 20 percent currently. While the official unemployment rate still remains at 5.2 percent, up from 2.6 percent at the turn of the millennium, once Mexico emerges from the recession, its economy, along with job availability, will only grow. This economic development, coupled with the demographic changes, increased border security, and the scarcity of jobs within the United States during the recession, has led to an unprecedented drop in unauthorized immigration from Mexico. The Pew Hispanic Center reports that the average inflow of undocumented immigrants from Mexico fell from around 500,000 per year from 2000 to 2005 to only 150,000 per year in 2007 through 2009. 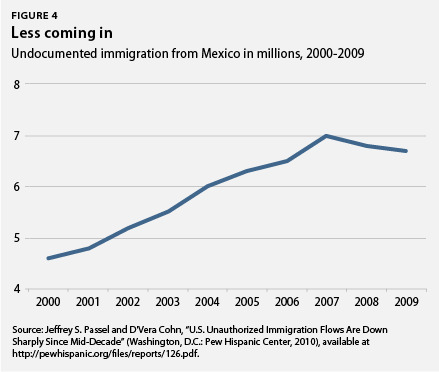 Likewise, Figure 4 shows that the number of unauthorized immigrants from Mexico living in the United States began to decline after 2007 following a precipitous increase at the turn of the century. This moment of decreased immigration, then, is an opportune time to think about how we might deal with a future in which there are fewer Mexicans looking to emigrate. As our economy improves, economic migration pressures—albeit diminished because of the changes described above—will begin to grow again and we must ensure we have realistic legal channels to regulate that migration. What we need is a two-part plan. First, we need a flexible method for assessing our nation’s labor needs, balancing the needs of American businesses while protecting American workers. Our current immigration system is too rigid and fails to account for our nation’s dynamic economy and changing demands. Second, we have to deal with the 11 million undocumented immigrants already living in the United States. These people are a part of our society and a majority of them (62 percent) have been here for more than a decade. They have set down roots and families here. Close to half (47 percent) of all unauthorized households are comprised of families with children, more than double the percentage in the native-born population (21 percent) or even among legal immigrants (35 percent) according to the Pew Hispanic Center. There are massive economic benefits to integrating this population. Bringing them into the legal workforce through a tough but fair process of earned legalization would add a cumulative $1.5 trillion to our nation’s GDP over the next 10 years. What’s more, it would support the creation of a significant number of jobs for Americans and generally raise the wages of all workers, both native and newcomer. Dealing with the immigrants already in the country, in a way in which they could contribute fully to the economic recovery, just makes fiscal sense, especially as fewer people seek to enter. Mexico’s changing demographics and economic growth, combined with the current slowdown in undocumented immigration, provide a moment to reassess our immigration policy. The question is: Will we seize it and reframe how we view immigrants from Mexico? Or will the dysfunctional politics around immigration policy prevent us once again from doing what’s in our national interest? Philip E. Wolgin is an Immigration Policy Analyst and Ann Garcia is a Research Assistant at American Progress. The authors would like to thank Maya Edelstein, intern at American Progress, for her research assistance.